As a Cub Scout Den Leader and Boy Scout Merit Badge Counselor I’ve taught young people that voting is a right and a duty. Citizenship and age determine our right to vote. This right differs from other rights though, in that it also demands duty. Like jury duty, if enough people refuse to participate, the system fails. It is a necessary component in the functioning of all democracies and, in particular, our democratic republic. We are taught from a young age that good citizens vote, but does voting make you a good citizen? I can make a good case for not voting (“Even voting for the right is doing nothing for it.”), but there’s a larger message in Thoreau’s words, a call to action: “A wise man will not leave the right to the mercy of chance, nor wish it to prevail through the power of the majority.” He is saying that voting alone is not enough. It never has been, never will be, never can be. “There is but little virtue in the action of masses of men.” Leaving to chance that your principles will be represented by any person other than yourself is an absurd notion. Even if your candidate were guaranteed to win, you often don’t even have a candidate to choose from that represents your side on many issues. It’s very likely that your ideas will lose, so why would you just vote and not take another positive action to defend your political beliefs for another four years? No, voting is hardly even the minimum requirement for good citizenship. A good citizen must get up on Wednesday, November 9 and continue to be involved in the politics of their community. What does it mean to be a good citizen, to be involved in the politics of the community? There’s no one universal answer for all people. For some, it means educating young people, either their own or others. It could mean participating in your neighborhood, your church, your school. It could be getting up and running for office or serving on a local board. It could mean being a great mom or dad. 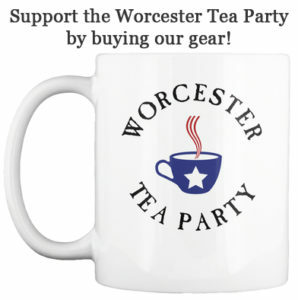 It could mean getting involved with the Worcester Tea Party and our efforts to educate citizens. We remain committed to promoting the ideals of the Tea Party movement, limited government, free markets, and fiscal responsibility. We can always use more help. Are any of these alone enough to make you a “good citizen”? Probably not. Thoreau called for civil disobedience, advocating that people must do what they feel is morally correct, even if it violates the law. He went to jail because he would not pay taxes that supported the Mexican War. Do any of us have the courage to go to jail for our beliefs? There are a few who do, but most of us struggle to find other ways to be good citizens. The point of his essay was that voting must not lead to complacency. We need to act. Many of us are probably fatigued from the stress and emotion of the Presidential campaign. Perhaps you’ll want to rest on November 9th, but when you are ready, choose your weapon and your battle. Get back out there and do the work of good citizens.